Lessons, concerts, parties, grades…ho ho ho! The list of things I need to get done before the holiday break is long, and time is short. One way I “get through” the pre-holiday excitement is to fill my December music class with creative movement activities, playing instruments, and lots of interactive activities. 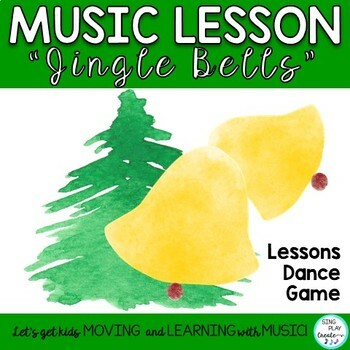 To try to keep hands and minds engaged and the holiday spirit positive, I created December music class stations. Interactive lessons help my students stay engaged and on task and minimizes classroom behavior issues. It is also important to me to keep students learning through the holiday season and to have fun at the same time. One way to solve the problem of student engagement is for students to rotate through music class stations. Here’s some ideas for your K-6 elementary music classes. I’ve found that setting up three stations works really well for K through Grade 2. For upper elementary, I can set up four to five stations. Sometimes I only set up two stations. I will have the class sing or work on a whole group activity and then break into two groups. After about 10 minutes, we switch. I like stations because they really make the time fly by fast! One reason I set my room up with rows and a circle is so that I can use the rows as the groups in the stations. Each row is a team and it makes for easy organization of groups in the classroom. 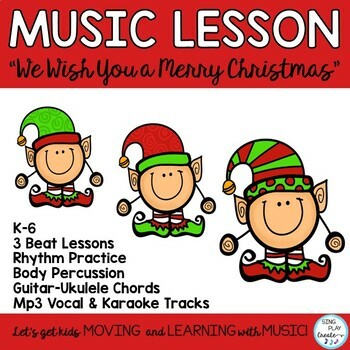 For example, I use a variety of activities in my December music class stations. Some of the stations combine body percussion rhythmic practice with learning to play xylophones. I’ve written some chants that students are practicing using body percussion, and then we go to the xylophones and turn them into little songs. My students love to do these kinds of activities. When you walk into the room, the students are engaged. There is a buzz of rhythmic and melodic sounds that signal that students are learning. This station set up is a new one I’m working on right now. I’m creating a timed video that plays cues for the students to move around the stations. HOW CAN YOU DO IT NOW? If you want to see another post on music class stations, check out my blog post on November Music Class Stations. Here’s a basic outline of what I’m doing with Kindergartners in December music class stations. Then, I’ll review the activities for each station. You can use any cards and pictures and have students put them in rows of four cards. First my students play them in activities as a whole group and then they play them in the stations. Specifically, I start class with our Hello Song. That get’s everyone into “music land”. Then, after we sing our Hello Song we do some holiday vocal warm-ups using my Holiday Vocal Exploration resource. Next, try putting the body percussion actions in 4 beat patterns. If you like this kind of activity, you can find my Creative Movement Rhythms Resource with these kinds of patterns. Moreover, once students “feel” the rhythms, it’s easy to transition to note reading. My students love these December music class stations where they work either with the whole group or with a buddy. The room is filled with tapping and chanting, and that means students are working hard. I’m also lucky enough to have a smartboard which I have students use to create and compose patterns. 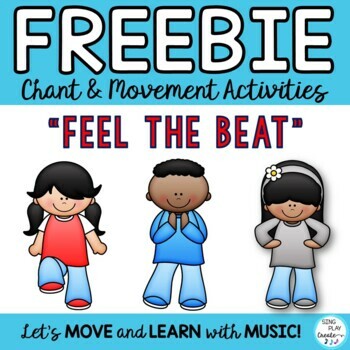 Try using your classroom songs and chants in your music class stations. 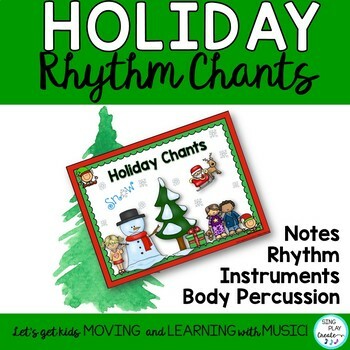 My Holiday Rhythm Chants Resource comes with 4 different ways to play and learn the chant. These kinds of activities can be used in your music class stations, whole group or sub plans because everything you need is in the resource. In addition, I add in a creative movement station. I love watching the Kinders “play” with their scarves! Already subscribed? Then go straight to the Free Resource Library and get the Scarf Activity Cards Here! Next, the students put them in rows of 4 and do the movements. They love changing the order of the cards and working with their groups to make movement patterns. Another ideas is to use vocal exploration cards, and students use scarves to show the path of their voice. Using the cards in stations is a great way to get your assessments done. You’ve got students in small groups and it’s so easy to get to know them better and what level of skills they can show you. And of course, I feel like they are getting in some holiday fun and learning too! TRY THIS CREATIVE MOVEMENT IDEA! Another creative movement idea is to use a YouTube playlist and let students get out their wiggles through scarf and movement activities. 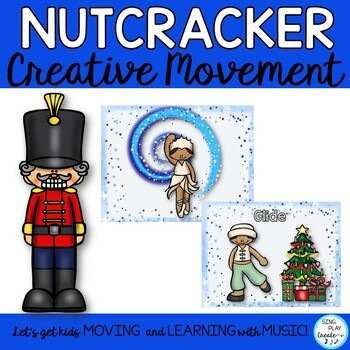 Creative movement is always a great activity for December class music stations. Pass out only gray, white, light and dark blue scarves. Put students in small groups and ask them to make up a routine that fits the music. I made some scarf movement cards that I print out and let my student put in patterns. Want these cards? Just subscribe to my website newsletter, and you’ll find them in the Free Resource Library. The fact is that students love to play instruments. By now, my upper elementary students can play on xylophones and recorders in stations. I print out simple melodies for them using note names, color notes or songs they know how to play. Place your xylophones with the sheet music in the four corners of your room. Try some of these ideas with your upper elementary students. Idea #1: You can use 4 beat Rhythm cards and ask students to create melodies using them. Choose C D E G A to introduce pentatonic scales. Idea #2: Try using Rhythm cards and ask students to play only 1 note on the recorder. What a great way to have them practice just “G” or “A” or “B”. My students responded to this activity really well and were able to grasp their understand and up their skills faster because they only had to focus on 1 skill/note at a time. Next, have them rotate around the four corners playing the 4 notes you want to reinforce- or have the last station be a short recorder song. Last, but not least, I try really hard to stay positive and calm even if the students are not! I think everyone will agree that the week before the holiday break is one of the most difficult for classroom management. I try to have a sense of humor. I put a picture of Santa on my board. Usually, I have a picture of the world there, and the kids have to stay “on top of the world” to get a good report. Now I’m telling them that Santa is at the top of the world—at the North Pole—waiting for us. So we’d better be really good and learn a lot so that we can make it to the North Pole and see him. This works great with my K through Grade 3 students. I also have many of my classes performing for each other and for the school. I think this helps everyone stay focused and positive. Do you have something that helps you keep a positive attitude? That might make a good December class music station. 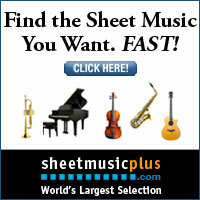 Check out resources with sheet music! Overall, for me, movement in the classroom helps everyone stay calmer and me more positive. It’s hard to stay positive and calm when the students are not! HAVE A SENSE OF HUMOR- I try to have a sense of humor. I put a picture of Santa on my board. Usually, I have a picture of the world there, and the kids have to stay “on top of the world” to get a good report. Now I’m telling them that Santa is at the top of the world—at the North Pole—waiting for us. So we’d better be really good and learn a lot so that we can make it to the North Pole and see him. This works great with my K through Grade 3 students. ADD IN PERFORMANCE OPPORTUNITIES-I also have many of my classes performing for each other and for the school. I think this helps everyone stay focused and positive. Do you have something that helps you keep a positive attitude? That might make a good December class music station. Lastly, self-care for me is making sure that I get enough sleep—that’s the toughest goal to keep. There’s just so much going on, and I want to do it all. But I make sure to maintain my yoga practice and aerobic workouts and try to keep the extra calories to a small amount. And-I also think it’s a good time to renew family and friend connections, and I place a high value on that too. I feel like my December goals are super important. Otherwise, I feel overwhelmed and a bit let down when the break comes. I’d rather have calm classes and students engaged than to feel like I didn’t get everything done. Here’s a blog post I wrote about self-care that will give you some ideas. 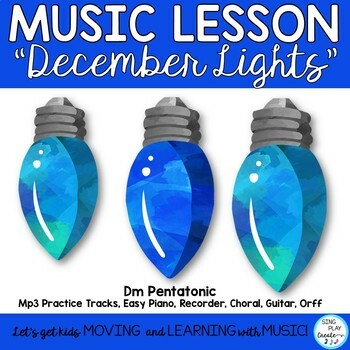 What kinds of activities will you use in your December class music stations? Here is a blog post that will help you throughout December music class, December Music Class Ho, Ho, Ho! 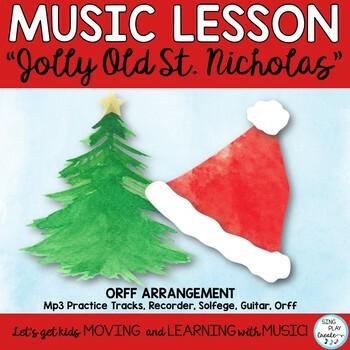 Another holiday-themed blog post is Teacher Tips for a Jolly Jinglin’ Music Class. Let me know how stations work in your classroom! I’d love to hear your successes and challenges. If you enjoyed this post, please share it with your teacher friends!